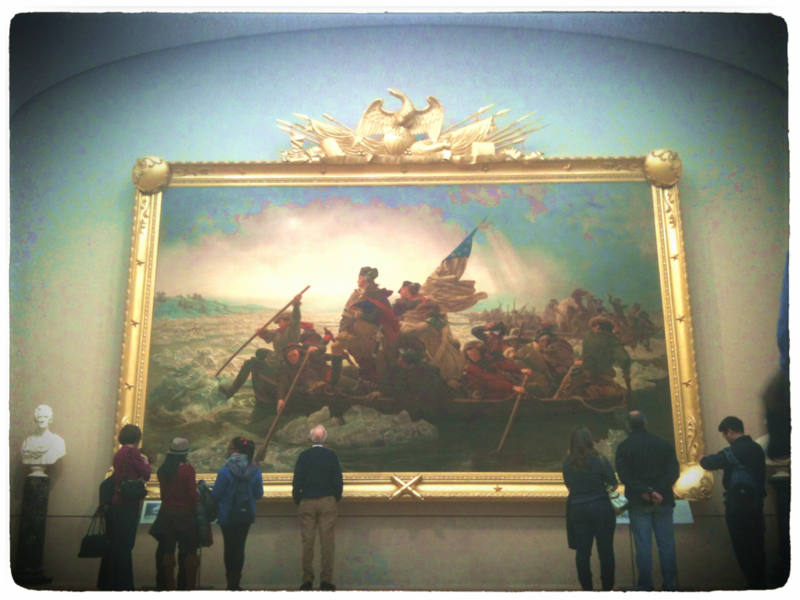 “First in war, first in peace, first in the hearts of his countrymen.” The monumental canvas of “Washington Crossing the Delaware” (1851), by Emmanuel Leuntze is the centerpiece of the refurbished American wing at the Metropolitan Museum. The frame is a recreation of the original, based on a photograph of the painting by Matthew Brady when it appeared at a major exhibition in New York. Say what you will about its historic authenticity (it was painted in Germany, after all), the piece is an impressive and imposing work. The re-working of the American wing is equally impressive. I particularly enjoyed the “visible storage” area, and the recreation of entire rooms from different periods of American history (including an early 20th century room by Frank Lloyd Wright). And I was struck by the number of paintings by Eakins and Sargent (including the latter’s experiments in impressionism). I came to the Met on a break from preparing to move from my Brooklyn apartment (de-crapifying is what I’m calling it – purging my place of unneeded goods and stuff so I don’t have to unpack it on the other end) to visit the recently unveiled American wing and the Islamic art wing, which was redone last year.